All of our chaps and chinks are custom made to order and because of the specific details that are involved in the correct ordering of these items and the variety of options offered we need you to email or call us at 520-686-2829. Note: All of our leather goods are handcrafted, custom made to your order products and we take extreme care and pride in the making of them. For delivery status on an order already placed email us. Have you ever wondered how Western Chaps, Chinks and the variations of them came about? Visit our Leather History page and learn more. Scalloped, border tooled waistband. Southwestern trim accent features brass spots. Contrasting scalloped leather accent with three bleed knot conchos. Pocket with double stitching and handcrafted leather button. 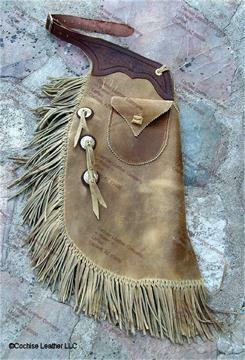 Border Tooled Yoke with Southwest Trim, Small Spots, Conchos with Bleed Knots, Pocket and Fringe. 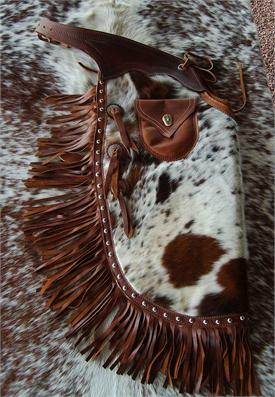 Western Hair-On Cowhide Chinks w/Pocket, Spots and Bleed Knots. Hair-on Chinks with Large Oval Spots, Bleed Knots, Pocket and Fringe. Border tooled waistband. 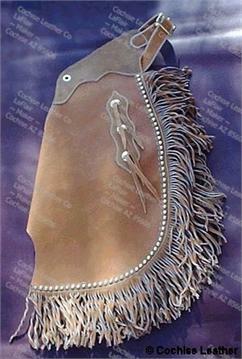 Smooth leather yoke, silver colored spots, conchos and bleedknots on leather cutout design.